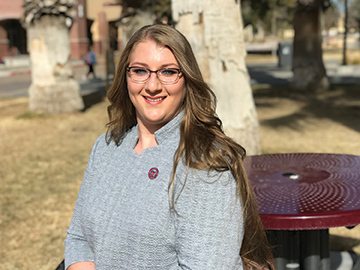 During an advising session as a freshman at New Mexico State University, Norann Calhoun received a flyer for the New Mexico Space Grant Consortium. She started attending meetings for the program in fall 2014, and she will graduate in May with not only a bachelor’s degree in chemical engineering but also with four years of experience as a student researcher. 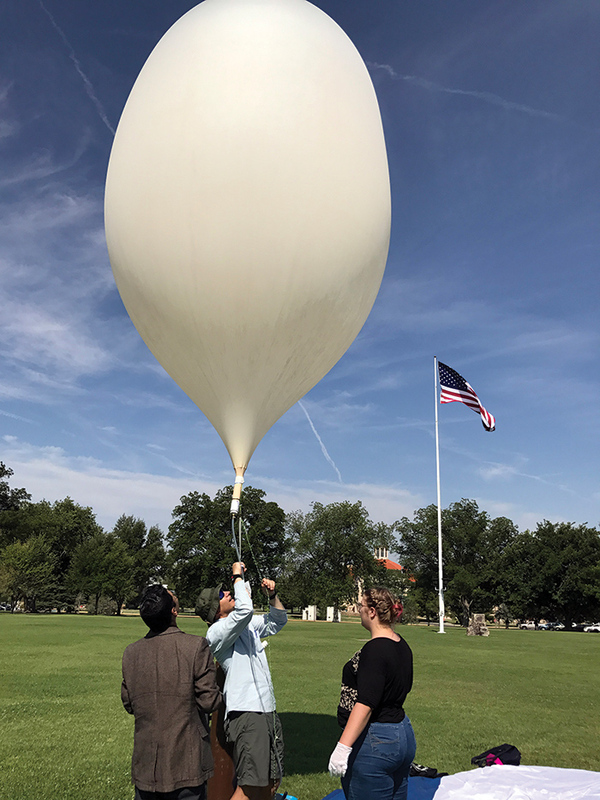 As a member of NMSU’s NASA-sponsored Eclipse Ballooning Project team under the direction of Paulo Oemig, senior research scientist with the NM Space Grant Consortium, Calhoun traveled to Beatrice, Nebraska, in August 2017 to launch high-altitude balloons during the total solar eclipse. One of the goals of the experiment was to reach 100,000 feet to see the earth’s curvature and the eclipse. The team camped in a chicken coop for a week and launched two balloons on two separate days. “Norann is an extraordinary researcher. A researcher is fundamentally curious. She is also unwilling to let barriers stop her from answering a question one way or another,” said Patricia Hynes, director of the New Mexico Space Grant Consortium. “Norann demonstrated such creativity and ingenuity in developing and testing her technologies for the flights we supported, it was inspiring to support her,” Hynes added. While her project had technical difficulties from the beginning, Calhoun is encouraged for the future because she is starting a team in spring 2018 to solve the design problems. One of the challenges Calhoun faced with her experiment was establishing a reliable method for implementing a delayed parachute deployment. Calhoun said she was thrilled with the result of the skydiving company collaboration, which created a device that delayed the parachute from opening. After graduation, Calhoun said she hopes to join the workforce and gain hands-on experience before possibly pursuing advanced degrees in the future. Paulo Oemig (center), New Mexico Space Grant Consortium research scientist, holds a high-altitude balloon during a test in June at the New Mexico State University Horseshoe while Krishna Kota (left), mechanical engineering assistant professor, and Norann Calhoun, chemical engineering senior, assist. A high-altitude balloon launch was part of the NASA-sponsored Eclipse Ballooning Project, which was held during the total solar eclipse in August 2017.